This regulated qualification is ideal for those already working or preparing to work within industry wishing to become a First Aider in the workplace for the purposes of the Health and Safety (First Aid) Regulations 1981 and the Health and Safety (First Aid) Regulations (NI) 1982. All successful students will be issued with a First Aid at Work Certificate, detailing their achievement. The HSE dictate, that to be valid in the workplace, learners must retake the First Aid at Work qualification before the expiry of 3 years from the date that the original qualification was achieved. If no more than one calendar month over this 3 year period, you may qualify to take the course again in two days rather than three. We call this our ‘requalification’ course. 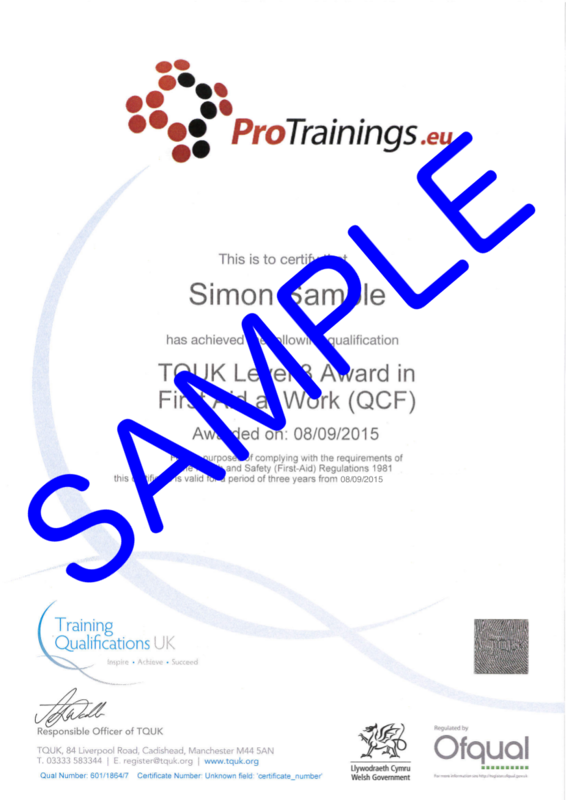 You must give a copy of our original certificate to your instructor to qualify. Please contact ProTrainings for further information.